Socrates Sculpture Park is pleased to announce a new Broadway Billboard by David Maisel, on view October 7, 2018 to March 10, 2019. 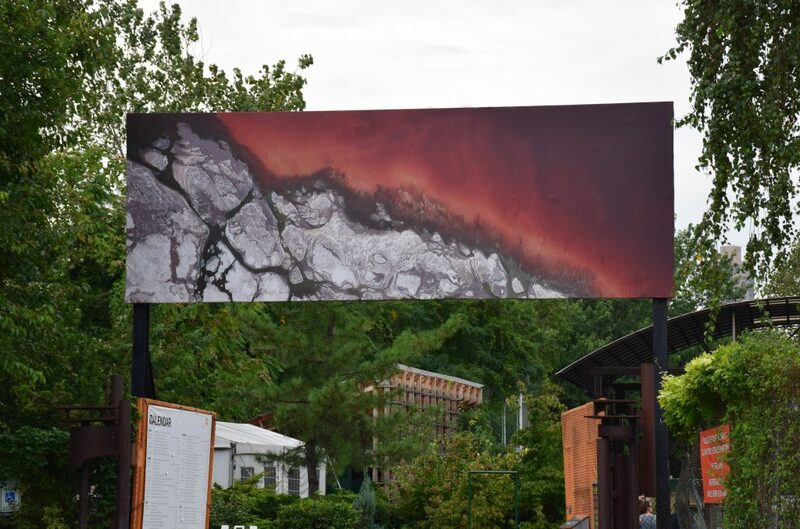 Maisel’s Billboard, The Lake Project 62 (detail), is cropped from a photograph within a series of aerial images of a California lake that traces the changes of human intervention on the site. The artist’s subject – Owens Lake – is at the center of the infamous California water wars of the late 19th and early 20th centuries. In 1913 the Los Angeles Aqueduct began to divert water from the Owens River to the newly expanding city, while Los Angeles Department of Water and Power (LADWP) simultaneously maneuvered to acquire the majority water rights. In little over a decade Owens Lake became desiccated, disrupting the migratory bird feeding ground ecology and devastating the ranching economy in the valley. The water depletion uncovered minerals beds that disperse carcinogenic dust by the location’s strong winds. By the 2000’s the site was identified as the greatest source of particulate air pollution in the United States, emitting cadmium, chromium, arsenic, chlorine and other powdered toxins. Maisel initiated The Lake Project in 2001, documenting the otherworldly topography created by years of human intervention. Around this time, the LADWP began efforts to mitigate and control the dust pollution, restoring limited water flow to the lake under EPA supervision. Maisel visited again in 2002, shortly after the dust mitigation program began, and again in 2015, when he captured this image of Owens Lake’s west shore near Cottonwood Spring. The crimson portion of the image is a pool of briny water colored by microscopic bacteria that live within. In the lower left corner, the barren lakebed playa crops up through the shallow water in the white islands. This area is braided with dark green drainage paths from the seeps and springs that assist the limited return of native salt grasses. Maisel’s Lake Project 62 (detail) expands Socrates’ imperative to present art that examines land use and environmental sustainability. While Owens Lake is geographically and ecologically distinct from the Park’s own New York City waterfront location, the Billboard acknowledges global trends of water scarcity, air contaminants, and environmental destruction that can be caused by unregulated land-use issues pertinent to the Park. Yet, Maisel’s photograph exceeds purely documentary or pedagogical function. It simultaneously allures with abstract composition and repels with knowledge of their subject. 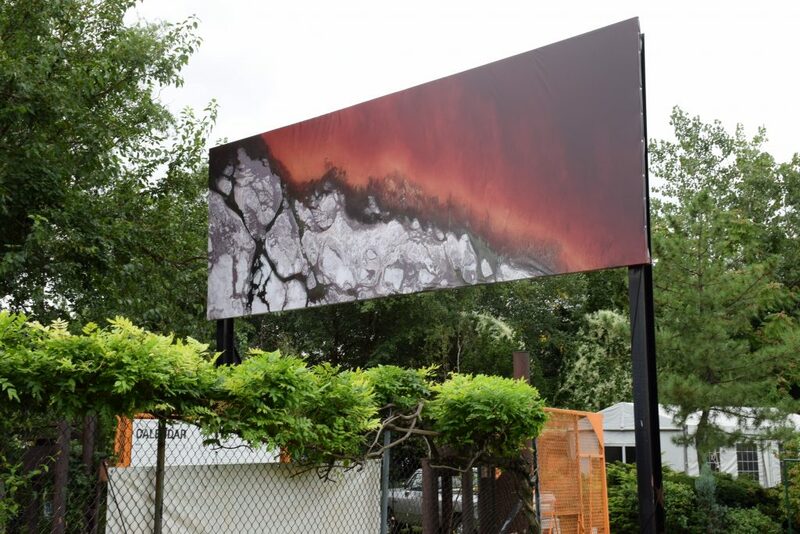 At Socrates Sculpture Park, this otherworldly landscape can be a site of reflection for contradictions and our complicity in the face of looming environmental destruction. As the word ‘detail’ in the title suggests, Owens Lake is only a small element in the larger picture of the planet’s degradation. Lake Project 62 (detail) is the 32nd iteration of the Park’s Broadway Billboard series, which launched in 1999 and has featured works by more than 30 artists, including Edward Burtynsky, Meschac Gaba, John Giorno, Douglas Gordon, Michael Joo, Los Angeles Urban Rangers, Wangechi Mutu, Catherine Opie, and Duke Riley.